Ever since I saw the monorail go through the Contemporary during my first trip to Disney at the age of 4, I knew that Disney was truly the greatest place on Earth! Some of my greatest memories of both friends and family take me back to times that I have vacationed there. I went many times with my family as a child and even begged a friend with a car to take me there on my college spring break trip to Daytona!! The picture that I have from that trip is a favorite! I have been there so many times that I have lost count. I have either visited or stayed at just about every resort on Disney property. Now that I am a parent, I have been able to share my love of Disney with my own children. We have had many great times in the Disney parks together, and have been fortunate enough to have experienced two Disney cruises as well. Disney just keeps getting better and better!! Working as a Disney travel agent is a dream job for me. Planning trips and sharing my love of Disney brings me great happiness and satisfaction. 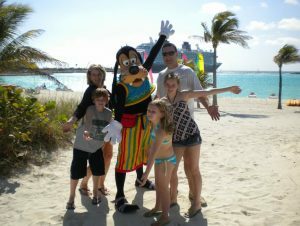 I take great pride in my helping each of my clients experience all that Disney has to offer. It’s been almost 40 years since my first trip to Disney and every time I go back, I feel like that little girl again, filled with a wonder and awe that can only come from the most magical place on Earth!